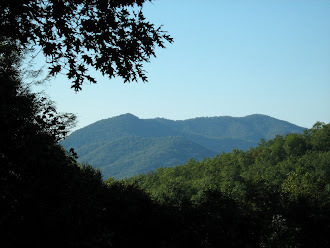 It's been a great day celebrating my 52nd birthday...the Joyce Kilmer Memorial Forest was breathtakingly peaceful and we visited a few western NC winery's afterwards...I'll share more about it in tomorrows post. But I did want to let you know I have indeed made it (click here to read a little more about what I mean). ...green beans and squash...a slow slow process but in the end worth the time it takes...I hope so anyway, I haven't made them before. But mostly I thought about it because today is the last day I'll be 51. For those of you who have known me for a long time, you'll know that turning 51 was a big deal for me because my mom died unexpectedly when she was 51 and I was illogically apprehensive of the year ahead of me...you can read last year's birthday post here...afraid I'd follow in her footsteps. I'm surprised by how emotional I am as I write this...it is relief?...sadness for my mom?...I'm sure some of both. Despite my tears, here I stand, alive, strong, healthy, trying to live every day stopping to see all that is beautiful and writing it all in this blog. My mom was part of my inspiration for living this log cabin life...I know she knows my life is good...and I am proud to say I believe I've progressed better than that inchworm! With that said, Johny and I are going to the Joyce Kilmer Memorial Forest tomorrow to hike and picnic for the day...beginning my 52nd year under the canopy of an untouched forest where the trees are over 100 feet tall and measure 15 to 20 feet in circumference...celebrating that I'VE MADE IT (will confirm that tomorrow, LOL!). There is nothing more important than being thankful for what life brings to you...appreciation for all that is good results in more good...gratitude multiplies! ~I'm grateful for my dad...he's been mother and father for over 26 years, and has been superb at it! He's a special person and has a special partner in Donald, whom I'm grateful for as well. Today is dad's birthday...Happy Birthday Dad! I love you more than words can say! Visit ABCWednesday for more posts on the letter G. Many thanks to the founder, Mrs. Denise Nesbitt, and to Roger for taking the helm. ...and this is the before shot...you can see how much brush has been removed. You can be sure that we are not stripping the bank of all vegetation...we are leaving all the roots in the ground as well as some of the foliage that isn't blocking the view to be sure we don't create an erosion problem. Eventually, there will be a lush carpet of rhododendron that we keep trimmed back, with the highlight of that view being the creek...we always enjoy listening to the creek, but also being able to watch it flow is perfection! Speaking of going with the flow...yesterday I shared my Crab Apple Jelly recipe with you...what I didn't share is that as I was writing the recipe post, I realized I had mistakenly added twice the amount of sugar that I had intended (I must have been thinking about the amount of water when I measured the sugar). I was quite bothered about it but I realized that what else could I do but go with the flow...everything was already canned (what's the worst thing that could happen...it's jelly after all)! This morning we tasted it, and you know what? It was good...sweet, but good. Now I'm considering collecting another batch of crab apples so I can try again...though there was a hint of cinnamony tart apple, it was quite sweet...I bet with half the sugar the tartness would really stand out...and I want to get it right. The good news is the posted recipe is correct...let me know if you try it and what you think! On another note, I spent part of this afternoon visiting with my friend Ron while Bertie went out running errands (he recently had a medical procedure so she doesn't like to leave him alone for too long). We laughed a lot...I learned some things I never knew about Ron and revisited some stories he's shared with me before...it was a real pleasure to chat with. I sure am going to miss them when they move! I hope you've been able to follow my flow of random thoughts today...nothing like going with the flow! I love crawling into bed when the sheets have been freshly washed and hung on the line to dry...they feel so crisp and smell so clean...and today was the perfect day for it! ...so I cheerily...yes cheerily, that's how much I love fresh linens off the line...stripped our bed and hung the sheets and pillow cases out as early as I could, taking full advantage of what was sure to be a gorgeous day. ...some leaves are already turning and falling, and it's only August! Maybe the fog folklore will prove to be true...though we may be in the minority when it comes to this...we hope we get lots of snow! We love winter and snow and the accompanying fires it requires. Last night, we had a nice fire in our fire pit, a great way to end the day and welcome this little cool front we got. Are you looking forward to fall? What about winter? I wrote about the lovely and useful Jewelweed flower last year when Johny has a close encounter with poison ivy, you can click here to read more. Jewelweed is said to help decrease the effects of poison ivy, but to be honest, Johny's experience was that the only thing that really helps is time. I find the blossom to be absolutely elegant with its interesting petals. Fortunately for me, it seems that this years rains have resulted in the expansion of Jewelweed fields around our cabin. They come in two colors, red and yellow, but it seems the red have taken over our woods. Whenever I walk along the road, especially to the garden, I see these fields surrounding me...little speckles of red and yellow with a thick green background of leaves. ...even the buds are dainty looking. The bees love them and have to fly deep inside to get to the nectar causing their backs to brush against the pollen to carry to their next stop! I find them to be absolutely exquisite...but it also has medicinal uses including being an anti-inflammatory and antihistamine properties, though I have not used them in that manner at this point (except our attempt at healing Johny's poison ivy which was not very effective). I'm sure finding the correct method for preparation is key in its effectiveness, so I haven't given up on it, but I sure do enjoy just looking at them!